Home / Resources / Commercial Security / How Does a Magnetic Lock Work? Leave it to science to help increase commercial security. Magnetic locks – also known as electromagnetic locks or mag locks – rely on special technology to secure doors. Here’s how. Traditional locks have a part called a bolt, also known as a latch, to extend into the door frame and lock the door. Magnetic locks don’t have this component. The actual hardware looks much more simple. It is composed of an electromagnet and an armature plate. An electromagnet is a specially engineered magnet which uses a current of electricity to produce a strong magnetic field. This type of magnet can be controlled by turning on or off the supply of electricity. A mag lock is a type of automatic lock which simply takes advantage of this controllable magnetic property. When the electromagnet is energized, the armature plate is attracted to it. The magnetic field is so strong that the force secures door and keeps it from being opened. There is no bolt or other part which physically connects the door and the frame. The door can be unlocked remotely and allow entry in two main ways: by pushing the buzzer switch which cuts off the power to the magnet, or using an access control system. With a keypad, card reader or biometric scanner, an access control system verifies the identity of each person and unlocks the door for authorized users. Some access control programs also have smartphone apps with remote locking and unlocking capabilities. Power is required to keep the door locked. This means that electromagnetic locks are fail-safe by default. Fail-safe locks automatically unlock when the power goes out, enabling people to leave the building safely in case of fire or an emergency. They are required on emergency exits, delayed egress and controlled egress doors. For high-security doors, a backup power supply or battery can be used to ensure that the door remains securely locked even during a power outage. Electromagnetic locks are designed to be installed at the top of the door and door frame. This is the best location to wire the magnet to the building’s electrical circuit and ensure that nothing inhibits the door from opening and closing normally when it’s unlocked. 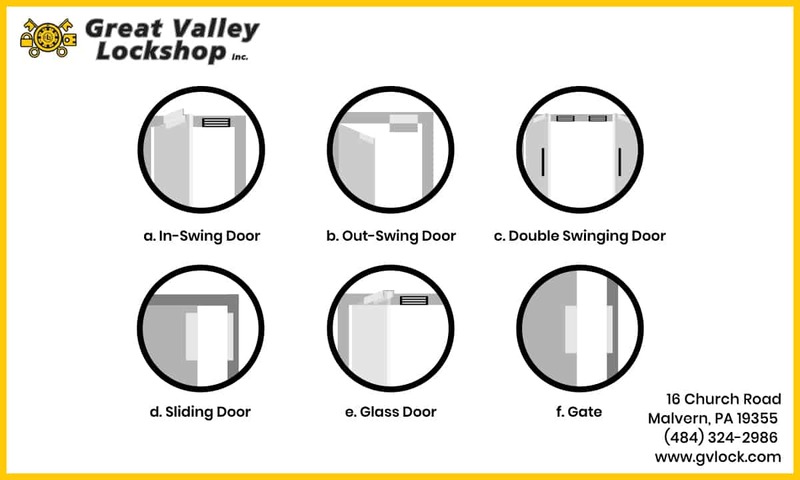 Diagram showing six ways that magnetic locks can be installed on different types of doors: in-swing, out-swing, double swinging, sliding, glass and a gate. The magnet is installed on the secure side of the door frame and the armature plate is fixed to the secure side of the door. In most situations, the ‘secure side’ of the door is the inside, where the device cannot be tampered with or forced. For glass doors, single doors and double doors, automatic swing and sliding doors. With access control systems with proximity readers, credential scanners, keypads or biometric input. For fail-safe applications, including emergency exits, delayed egress and controlled egress doors. On traffic control doors limiting the flow of people into a facility or certain areas of a building. At exterior entry points and security gates. There are many benefits to using magnetic locks for offices, facilities or business buildings. First, mag locks are simple and require relatively little time to install. Installation requires the magnet and armature plate to be installed at the entry point. Then, an electrician will connect the device to the building’s electrical network. With this type of lock, there are no keys needed and no copies to be made. People inside can quickly grant access and buzz someone into the building. Plus, the locking and unlocking function is instantaneous, making it a convenient and safe solution. Magnetic locks have no moving parts; they can’t jam and don’t have key problems. They also don’t wear out with time the way a tradition lock mechanism would. Finally, this type of lock can’t be forced, picked or pried like a traditional bolt lock. For buildings where security is a concern, the locksmith can install a magnetic lock which provides an extra strong holding force. Great Valley Lockshop supplies, installs and services a wide range of access control hardware, keyless, biometric and remote access devices. Find out more about our advanced entry system solutions and services. Contact our professional locksmiths at 610-644-5334 or fill out our free online estimate form.